tags: 3d items, Classes, Craft Project Central, Gift Giving, Stampin' Up! The bonus project for the April edition of Craft Project Central is designed by Sharon Burkett. Take a visit to Sharon’s blog to see more of her lovely work and don’t forget to let her know how much you love it. 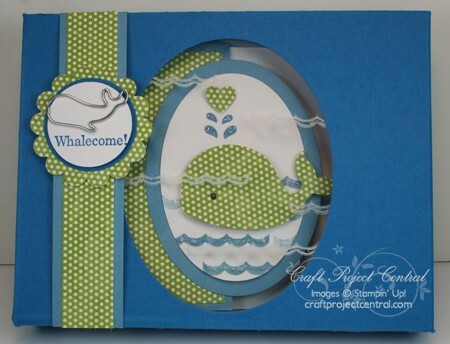 Have a creatively fun time making this box set of cards using the adorable Oh, Whale stamp set. You will be crafting and learning three different card folds that you will be able to use in your future card making. This would make a great gift or a fabulous class! To get the instructions for Sharon’s bonus project, just subscribe to April and meet one of the bonus project requirements of subscribing to two or more months in a row, putting the Craft Project Central badge on your blog, or referring a friend and when they subscribe letting us know. from → 3D items, Craft Project Central, gifts, Stampin' Up!